Ou r last class for this term was completely outdoors. Both groups joined together to walk around Curl Curl Lagoon, listen to the history of the area, and look out for various items on the way round. I had designed a booklet for the children to fill in on the way around and I also asked the children to think about uses of water, and to look out for birds, plants and water tanks. There were some altercations in the group, the usual attraction of sticks and branches to use as weapons, and it was hard to keep the group together but I think we all benefited from the time outside. I enjoyed researching the history of Curl Curl Lagoon. In the 1930s and 1940s people used to swim and fish in the lagoon and the water was even clean enough to drink, but nowadays the water is too polluted and none of these activities are allowed. The area around Greendale Creek (which runs into the lagoon) was used for market gardening in the 1950s, but shortly afterwards, it became a rubbish dump. Virtually all of the original native vegetation disappeared. The current sports fields and netball courts are built on top of this rubbish and leaching of pollutants into the soil can affect the water quality. The industrial area off Wimborne Road also has an effect on the water. As you walk around the creek and lagoon there are always pieces of rubbish lying around. I usually take home a handful to recycle or dispose of. I know there are hundreds of people who come to this area to take part in sports, use the community centre or the playground, and it is probably only a few who leave behind rubbish instead of disposing of it properly, but I wish that there were more respect for our natural environment. Littering, to me, is far more anti-social behaviour than children ‘hanging around’. The Curl Curl Lagoon Friends have instigated a rehabilitation project for the lagoon and creek area, Stage 1 of which was a gross pollutant trap in the creek near Harbord Road. 300 tons of litter and sediment are cleaned from this trap every year. Stage 2 was the restoration of the creek between Harbord Road and the footbridges, creating a multi-use pathway beside the creek and landscaping including planting many native species. Stage 3 targeted the rest of the creek up to the lagoon, including installing a weir between the creek and the lagoon to maintain the water levels in the creek. 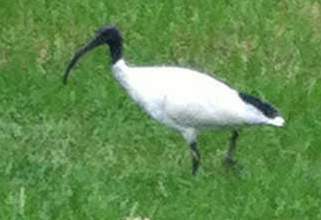 There are also two areas where the vegetation is being actively managed to return it to those for a native wetland. My own family has made use of the recreation areas and the pathway round the lagoon and we have been excited to see eels in the water, although nothing as large as they used to catch in the 1930s. 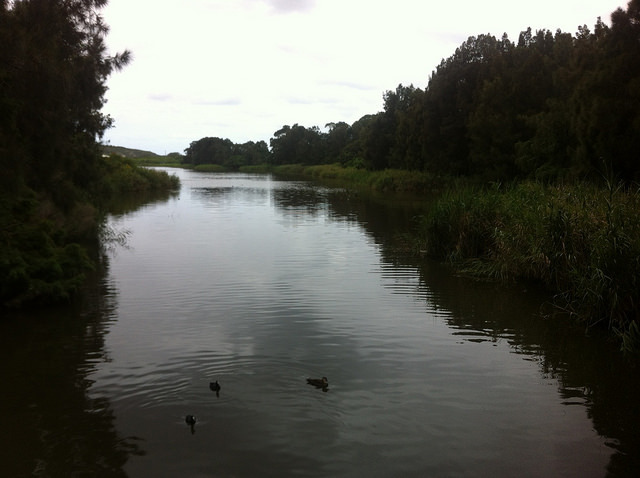 Warringah Council monitor the water quality in the lagoon, and it is gradually improving but is still very poor. You can download the 2015 report card for the four Warringah lagoons here if interested. Imagine you are a settler: Children might want to find a map of an uninhabited area and work out where they would locate essential services if they wanted to settle in that area. They could read about early explorers and settlers to find out what they brought with them, what they had to do without and what they built first. This could even overlap with space science, if they think about the Mars One settlers and what they will have to do when they arrive, firstly simply to survive and maybe even to ‘terraform’ Mars. Researching changes to your own local environment is a great project, helping children to develop their research skills and to understand the interactions between humans and the physical landscape. The information may not be on the internet! You could try going on a walk led by aboriginals, visiting the local history section of your library and looking for a local history group or perhaps a regeneration group like our local Curl Curl Lagoon Friends. My whole family were ill for about a week so I cancelled one Friday’s class and rescheduled to the next Thursday for those who could make it. We did a whistle-stop tour through the history of astronomy by looking at key figures and placing them on a timeline. The children didn’t seem to have heard of many of the characters so that would be an area worth exploring more, if they were interested. I also introduced a few women astronomers and those from cultures other than the Euro-centric/’Western’ developed countries that tend to be mentioned in these timelines. 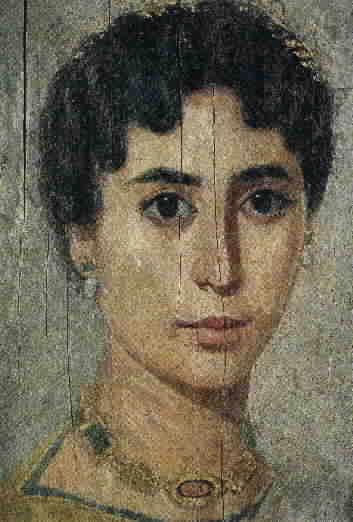 Hypatia of Alexandria was the daughter of the mathematician Theon Alexondricus. She worked in the famed Library at Alexandria and became head of the Platonist school at Alexandria. She used astrolabes to locate and track the movement of the stars, and produced a detailed table of her observations. Sailors used the astrolabe and her tables for navigation for the next 1200 years. We have no pictures of Hypatia but this is a picture in the British Museum showing an Egyptian woman from around the fourth century BC. After trying out my digital thermometer and hygrometer (a device which measures humidity), we went into my garden to peer at my neighbour’s handy little weather station with anemometer, wind vane, rain gauge and what looks like a solar cell (perhaps for recording hours of sunlight). We had a pretty informal discussion about what meteorological measurements we could make and how they might be useful, particularly focussing on three situations: (a) tornado prediction; (b) crops susceptible to fungal diseases; (c) bush fires. We then set to making our own anemometers (which measure windspeed). These are not too tricky to make, although younger children might prefer making paper windmills (pinwheels) instead (but you don’t really need a hammer to stick the pin into the wooden skewer or dowel). In the next class, the younger children rearranged some cards to make a diagram of the water cycle. Then we talked about changes to the Earth’s Surface – rapid or slow, and natural or caused by humans. I had printed out various situations in which geographical features change, many of them showing floods or drought. We discussed why water was essential for life, and briefly touched on weathering and erosion. 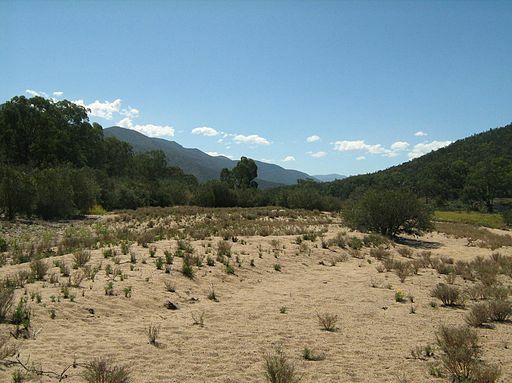 The sandy bank of the Snowy River just north of Suggan Buggan, Victoria. Before the river was dammed upstream the sandy area would have been completely under water. Transferred from en.wikipedia; transferred to Commons by User:Bidgee using CommonsHelper. The younger children drew their own diagrams or plans of an imaginary settlement with essential features like water, food, shelter, medical aid etc. While they were drawing I read from the DK book ‘A Life Like Mine’, created in association with Unicef and setting out the Universal Rights of the Child. 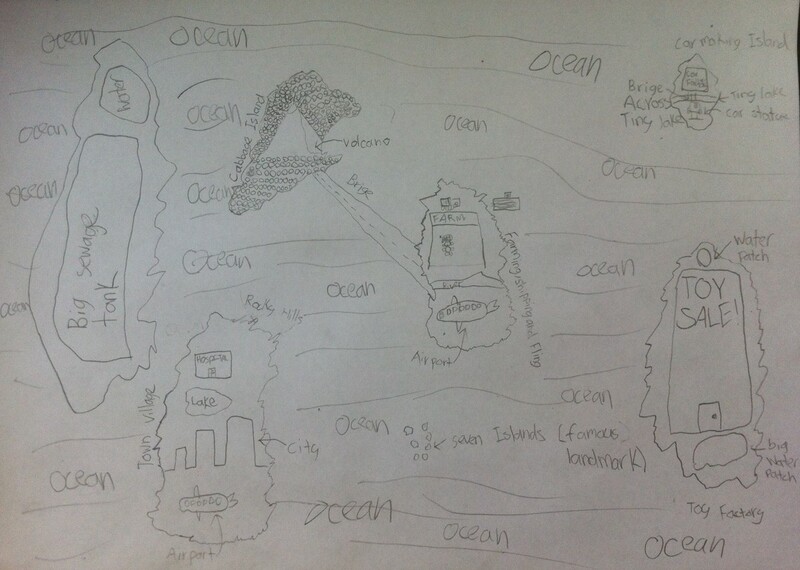 The children altered their diagrams a little based on whether they had fulfilled certain requirements. I loved the way one child drew a water treatment unit next to the river when she realised it was important that our water supply was clean. This activity worked fairly well. It was a hit for some children who do not usually enjoy writing, but enjoyed labelling their diagrams. However, some children were not keen on the drawing and I wished I could have planned a more kinaesthetic activity, perhaps a board game or one where they had to construct and place certain key buildings/infrastructure on a 3D landscape. The water cycle is not in the syllabus for older children. We skipped that part and went straight on to discussing changes to the Earth’s surface with the same pictures as before. I also used some information I prepared a year ago covering features of different types of extreme weather (e.g. cyclones or tornadoes). I supplied the children with photos, diagrams, descriptions of how they form and other parts of information and they had to assign the information into the right rows or columns in a large grid on the floor. To be honest these activities were not a great hit with the older children, and in both classes I had distractions including my daughter screaming in the background. I would redesign this session if repeating the course. Solar System Trading Cards This is simply a card game online, with no cards to print out, although students might be interested in designing their own. You can skip straight to the ‘activity’ if you don’t want to read all the revision notes. Be aware that in England and Wales Key Stage 3 covers Year 7 to Year 8. Learn about weather instruments and weather forecasting on weatherwiz kids. There’s more about weather forecasting here on exploringweather.com, and about tornado forecasting here, and about observing the weather in Australia here (including information about Aboriginal observations of the seasons). Try this interactive activity. You can skip the anagrams at any point just by clicking on ‘continue’. Disaster Resilience Education (includes interactive game – although my students were not particularly impressed by this one). Make your own anemometer following the video above or one of these two links: wikihow or US South East Regional Climate Center (pdf). Printable water cycle or interactive one on three different levels – I’ve linked to the intermediate one but you can quickly change to easy or advanced. 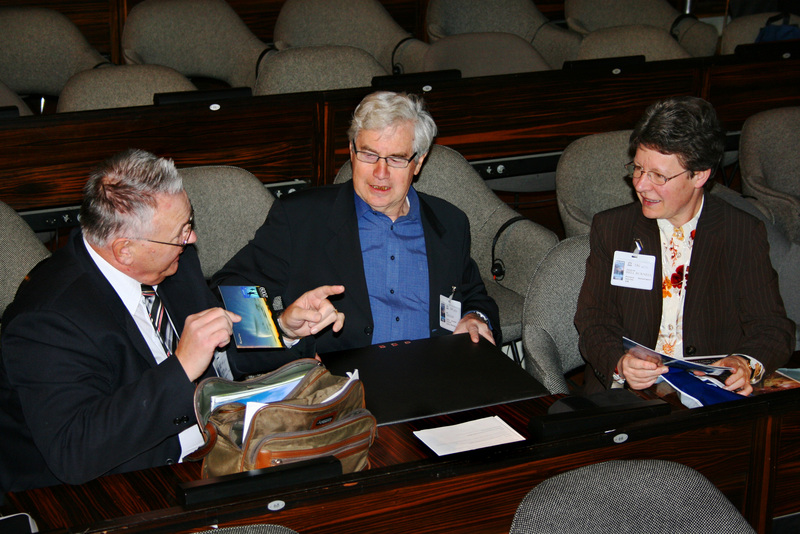 Oxfam UK Water Week has videos and other educational resources. ‘Old Bernie’s Story‘ is an online game about changes to the environment, especially use of water. Even if the Twelve Apostles take less than a day to collapse, the processes take years to wear rocks down so that it reaches that point. However research in 2013 in South Africa found that some natural processes can erode rocks instantaneously. In the Year of the Dragon. Gamers say the first two can be played from ages 8 and up but the third one is recommended for ages 12 and up.